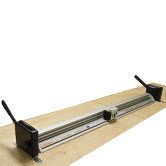 Simplex offers accuracy of general purpose cutting for graphics, photos and signs mounted on foam centered boards. The Simplex carries a guaranteed accuracy to within .03" over the full length of the cut. Simplex is ideal for cutting PVC foam board, vinyl, woven fabrics, foam centered board, honeycomb and corrugated plastics, film, paper, tissue and many more flexible and rigid materials. The Simplex is designed to be used as a portable unit and not intended to be used with the Big Bench or Lift & Hold mechanism. All Simplex Cutter bars use utility knife blades and feature a blade depth adjustment and a spring-loaded blade ejector. The Medium & Heavy Duty utility blades will cut to a depth of 10mm (3/8") and XR Long blades cut to a depth of 13mm (1/2"). 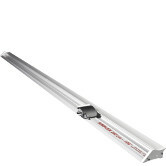 The patented linear bearings have been tested under load for 1600km (1000 miles) and carry a 20 year guarantee. Full length silicon rubber grip strips ensure all work is clamped when cutting and also protect the surface of the material.